[19:33] <+WetInkBrandon> I’m Brandon K. Aten, one of the owners of Wet Ink Games, LLC. [19:34] <+WetInkMatt> I am Matthew Orr, the other half of Wet Ink Games. [19:34] <+WetInkBrandon> I’ve been playing tabletop RPGs as long as I can remember and have been writing them for almost 15 years for one company or another. [19:35] <+WetInkBrandon> A few years ago, Matt and I had been working on a number of projects together for two different companies, in addition to running our regular weekly game. [19:36] <+WetInkBrandon> Wild Skies grew out of the setting we were running, and we decided that we would make a run at putting our own games together under the Wet Ink imprint. [19:37] <+WetInkBrandon> At the tail end of 2015 we launched our successful Kickstarter, and hit the ground running. 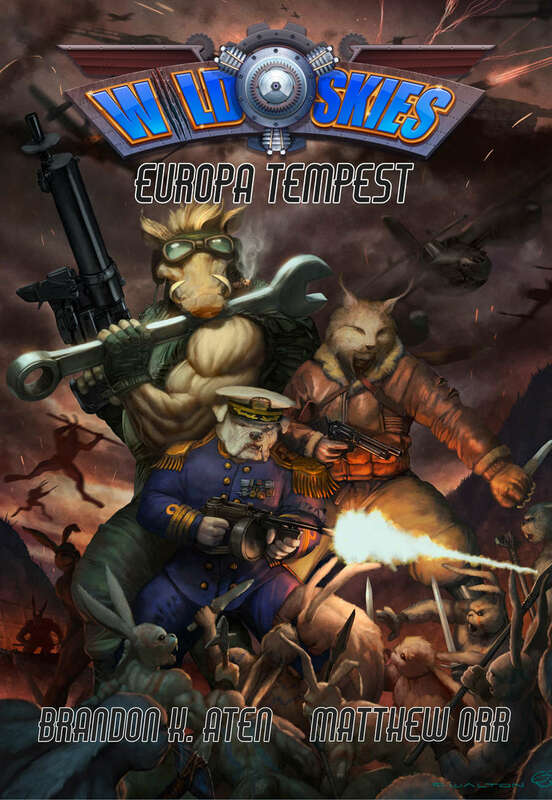 [19:38] <+WetInkBrandon> Wild Skies: Europa Tempest, designed and written by Brandon K. Aten and Matthew Orr, is the core rulebook of the Wild Skies setting in which players take control of anthropomorphic animal characters in a post-World War I alternate history Europe. Pulp-style technology and unique animal abilities contribute to the narrative storytelling of the game. [19:38] <+WetInkBrandon> The game uses the new Compass SystemTM which merges traditional alignment and experience systems, allowing players to integrate their character’s personal motivations with rewards of their own choosing. With 40 animal types, 20 careers, and 80 skill specialties, players have a wealth of options at their fingertips. [19:39] <+WetInkBrandon> The book also includes 16 ready to play characters. [19:41] <+GenoFoxx> So Mighty Tiny without the Apocalypse? [19:41] <+WetInkBrandon> Since this was our first product, there was a bit of a learning curve, but we have had some excellent support from our friends and colleagues in the industry as we’ve run into roadblocks or had questions. [19:41] <+WetInkMatt> We promoted our Kickstarter here back then and I’d think we have delivered on what we said we were setting out to do. Thanks, Dan, for letting us come back and talk about it again! [19:42] <+TravisLegge> Forgive me if this has already been asked, but what is the core engine of the game? [19:42] <+WetInkMatt> There was an “end of everything” in the fact in the setting WWI went on longer and Russia, Germany, France and Britain ALL had revolutions. [19:44] <~Dan> Thanks, guys! The floor is open to questions! Want to field TravisLegge’s question first? [19:45] <+WetInkMatt> Travis, the system is what we’ve named the Compass System. It’s conflict resolution is percentile based but D6 are used to augment most rolls. [19:46] <+WetInkMatt> More skills and abilities, more D6 you have to “Save” a bad roll or maximize positive impacts. [19:47] <+TravisLegge> Sounds pretty cool. I like that approach! Thank you! [19:48] <+WetInkMatt> Most skills and weapons give specific bonuses when a Resounding success is scored. That exact threshold is different for different difficulties. [19:48] <+WetInkBrandon> Since these D6 (or Skill Dice) can be used to augment a roll up or down, a player is able to control how well they accomplish a task, or can avoid catastrophic failure. It really rewards accuracy, not just rolling high numbers. [19:50] <+TravisLegge> So do skill rols have, like a range of efficasy? It’s possible to roll too high? [19:52] <+WetInkMatt> It’s not all numbers, though. The other big part of the game is the Moral Compass. During character creation you pick your character’s motivations and what rewards you will get when you earn enough “Plot Points”. You are encouraged to think of each motivation on your Compass as a story arc. Then tell those stories of the character’s journey through life. [19:53] <+GenoFoxx> so the setting is the Prisoner of Zenda by way of Wind in the Willows? [19:55] <+TravisLegge> THats awesome! Thank you! [19:55] <+WetInkMatt> More Indiana Jonesy pulp and a healthy dose of war stories, but Wind in the Willows was part of the inspiration. [19:56] <+WetInkMatt> Thank you, BPI. [19:56] <~Dan> Is there an in-setting explanation for the animals, or is that just a given? [19:57] <+WetInkBrandon> Dan, the animals ha always existed. [19:57] <+TravisLegge> I freaking LOVE Sky Captain. [19:58] <+BPIJonathan> I cant wait to pick up my print copy. [19:58] <+WetInkMatt> Dan, it is just a given. There have never been humans in this setting. Yet somehow human up to about 1906 was exactly the same. [20:00] <~Dan> How do they distinguish their animal natures, then? [20:01] <+WetInkBrandon> Can you clarify your question, Dan? [20:01] <~Dan> Well, if a guy is a pig man, what is he called? [20:03] <~Dan> Right, but what would you describe him as being? [20:03] <~Dan> Or do the animal people not distinguish between themselves? [20:05] <+WetInkBrandon> Everyone knows Don Karnage is a coyote, but to the crew of the Sea Duck, he’s a pirate. [20:06] <+WetInkBrandon> There are elements in the setting that do touch on some elements of “racism” in the setting. Some pig men prefer their own kind or something like that. [20:06] <~Dan> Some animals are more equal than others? [20:07] <+WetInkBrandon> But in some circles, yes. [20:09] <~Dan> What are sorts of revolutions took place in the various countries? [20:09] <+Le_Squide_> So, what’s post great-war europe like? Any parts you’re particularly proud of? [20:10] <+WetInkBrandon> Oh two excellent questions at once! [20:15] <+WetInkMatt> Germany’s revolution was very short lived. They kicked out the Kaiser, but ended up asking him to come back. Germany is pretty big in the setting and the older, wiser Kaiser now finds himself trying to keep the young hot heads from going to war with everyone. [20:17] <+WetInkMatt> France experience a native fascist takeover in Paris. The republicans fled south and after a few years of civil war there is a North and South France. [20:18] <+WetInkBrandon> Out of all the nations and descriptions, I think the one that I’m most proud of is how we tackled France (as Matt discusses above) It was a really cool idea and a much different take than I’ve seen in any other alternate history setting. [20:18] <+WetInkBrandon> The really cool thing about the setting, though, is that you don’t have to be a part of any of those groups. [20:19] <+WetInkMatt> Russia had the Red communist revolution, but the Bear Tsar took flight in his huge flying wing and was never officially deposed. Several factions now claim to be fighting to hold the country together for the Tsar. [20:20] <+WetInkBrandon> These groups can work with and for many of these nations, especially since piracy is also a big problem. [20:22] <+WetInkMatt> There were some other shake ups too. Spain broke apart and is kinda like a tiny EU, Austria straight-up joined Germany, leaving Hungary a decent-sized power in the east. Parts of Poland have declared independence from Russia. [20:23] <~Dan> You’ve touched on this, but can you say a bit more about the tech level? Is there a reason given for the tech spikes? [20:23] <+WetInkMatt> We wanted to rattle everything around to give players the ability to be just about any political stripe from just about any place. [20:24] <+WetInkMatt> #1 reason: flying battleships are awesome. [20:24] <+WetInkBrandon> What he said! [20:24] <+WetInkMatt> Also, that’s no moon. [20:25] <+WetInkBrandon> Since this is post war period (which would roughly translate to the interwar period in our own time), but the wars never fully stopped, technological innovation kept happening. [20:25] <~Dan> How do the flying battleships fly? Are the zeppelins, for example? Heli-ships? [20:26] <+WetInkMatt> Not cavorite, we call it Vrillium, taking the name from Vril: The Power of the Coming Race. [20:27] <+WetInkBrandon> most airships still have a form of gasbag, but they can be internalized and armored a lot more easily. [20:29] <+WetInkMatt> I mentioned 1906 before, that was the year HMS Dreadnought was launched IRL. In Wild Skies it was not just the first modern battleship, but the first flying battleship as well. [20:29] <+GenoFoxx> how long until jets are available? [20:30] <+WetInkBrandon> Geno, that is a good question. [20:30] <+WetInkMatt> We have called the setting “diesel-punk”, but I don’t think we mentioned it yet tonight. [20:32] <+GenoFoxx> are there supernatural powers? [20:32] <+WetInkBrandon> in regards to the nations each having their own feel, the French planes are all push planes with rear props. [20:34] <+WetInkMatt> Some of the jumping, hearing or strength animal abilities approach superpowers, but we don’t plan to go supernatural in this game. [20:35] <~Dan> How does combat work? [20:35] <~Dan> Oh, and do you have that link to the character sheet handy? [20:35] <+GenoFoxx> are you planning on adding a Mongo or Martian expy in the setting? [20:38] <+WetInkMatt> The most pulp adventure thing we have in mind in that direction is a geo-thermal Antarctica with prehistoric giants. [20:39] <~Dan> Giant… what? Animal people? [20:39] <+WetInkMatt> Mars is a good idea though. [20:39] <+WetInkBrandon> The cool thing about it is that you only roll initiative once, and then throughout the combat, you are constantly moving position in the initiative order, depending on what actions you choose to take. [20:40] <+WetInkMatt> Dinosaur characters with stone age tech. Their flying machines are just unrefined vrillium ore lashed to bamboo cages. [20:41] <~Dan> Ha! That’s awesome. [20:42] <+WetInkMatt> We have ideas for all the continents if we ever get there. We plan to do an America book next. [20:42] <+WetInkBrandon> Air combat is organized using the same mechanics as regular combat, but it really gives the feel of jockeying for position in a dogfight. [20:42] <~Dan> Any early thoughts on the status of the U.S.? [20:43] <+WetInkBrandon> You can only attack people lower than you in initiative, so you want to make sure you don’t fall to the bottom. However, gunners in turrets can attack anyone. [20:43] <+WetInkMatt> Isolationist. Workers’ paradise. Tesla tech everywhere. [20:44] <~Dan> Soooo…. what do they have? [20:45] <+WetInkMatt> Tesla. Tech. Everywhere. [20:46] <+WetInkBrandon> I don’t want to reveal too much before our next Kickstarter campaign for that book, but that’s not too far off, Dan. [20:47] <+WetInkBrandon> In Wild Skies we talk about how America focuses on directed energy. We’ll get to show off some really cool stuff. [20:49] <+WetInkBrandon> As Matt said, we have plans for a bunch of books in this line and we’ll keep knocking them out. [20:50] <+WetInkBrandon> We have solid plans for the next three books and have been approached by writers who want to work on at least two other areas in this setting. [20:51] <+WetInkMatt> One thing about combat in the setting is that guns can be pretty nasty. Punches and hand weapons typically deal a single digit of damage, but with guns you start rolling dice. You aren’t supposed to take a bunch of hits you are supposed to get out of the way. [20:52] <+WetInkBrandon> After GenCon our priorities are to wrap up the last few stretch goals (adventures and added faction pdf downloads), and then we’ll be assembling the creative team for the America book, tentatively titled Liberating Strife. [20:53] <+BPIJonathan> You still allowing for backers to pick up at GenCon? [20:54] <+WetInkMatt> GenoFoxx, you have a lot of good ideas! [20:55] <+BPIJonathan> I sent one about pick up at GenCon but didnt get a reply, so I was verifying pick up. I will resend. [20:55] <~Dan> Will you guys have a booth at GenCon? [20:57] <+WetInkMatt> Thanks for that set up, Dan! We will not have a separate booth at GenCon, but Wild Skies will be on sale at the IGDN booth, 2437. [20:59] <+Le_Squide_> Do you guys have an example of play posted up anywhere or a youtube video? [21:00] <+WetInkBrandon> BPI great! If you want to talk freelancing, you can also send an e-mail and we can get that conversation started too. [21:00] <+BPIJonathan> Im always ready to talk freelancing. [21:00] <+WetInkBrandon> LeSquide, we have a YouTube channel which presently has our proof review on it, but we’ll be adding more videos soon. [21:01] <+WetInkMatt> We want to record some short videos to walk through some parts of the system like creating a Moral Compass and running the rolling initiative. [21:01] <+WetInkBrandon> We will be showing how to craft and move on the Moral Compass, how combat works, and we may even get a live play session or two. [21:03] <~Dan> Are guided munitions a thing in the setting? [21:04] <+WetInkBrandon> Dan, not inately. [21:04] <+GenoFoxx> could vrillium be weaponized? [21:04] <+WetInkBrandon> What I mean by that is that since it is a pulp setting, what pulp setting would be complete without a crazy mad scientist? [21:06] <+WetInkBrandon> There are careers where characters can pretty much craft gadgets and goofy machines in to do these and other awesome things. [21:06] <+WetInkMatt> If you succeed at Science and Engineer skill rolls, we’ll see what happens. [21:07] <&Le_Squide> Could you relink the youtube channel in here? [21:10] <~Dan> What kind of directed energy? Tesla death rays? [21:11] <+WetInkBrandon> Dan, pretty much. [21:11] <+WetInkMatt> It’s a lightening gun, I think he had one of those. [21:12] <~Dan> Is it a given that most adventures will be airborne? [21:13] <+WetInkBrandon> Vrillium is a really valuable material, and the weaponization of it could be done. That would make a really cool story your group can tell together. [21:13] <+WetInkBrandon> That’s one of the things I really like about how we set the game up. [21:14] <+WetInkBrandon> The GM is considered a player and everyone is working together to achieve their motivations as individuals and as a group. Everyone is telling the same story. [21:14] <+WetInkMatt> It’s up to your party and the story, Dan. Planes are around and many goods move by air. But trains, city alleys, mines, ships, etc. are all part of the setting too. [21:15] <+GenoFoxx> I haven’t asked this yet but Dan knows it’s inevitable …..Mechs? [21:17] <+WetInkBrandon> If you scroll to the bottom of this page, you’ll see an example of the Tiger walker. [21:18] <~Dan> Huh. Well, there you go, GenoFoxx. [21:19] <+WetInkBrandon> This brings up another really good point. [21:20] <+WetInkBrandon> Wet Ink Games has a number of concepts in addition to Wild Skies. These game lines are all in some phase of early development, and I am personally chomping at the bit to get a mecha combat rpg out of my brain and onto the page. [21:21] <+GenoFoxx> is that the Rhino one? [21:21] <~Dan> In the time remaining, is there anything we haven’t covered that you’d like to bring up? [21:22] <+WetInkBrandon> Well, first I’d like to thank you for having us on. This has been a learning process for us, and you were there at the beginning. [21:23] <+WetInkMatt> There’s an 8-page comic in the book drawn by Mike Mumah. It’s based on one of the first adventures we played in the setting. [21:23] <+WetInkBrandon> Secondly, I’d like to thank you all for the questions and conversation. [21:23] <+BPIJonathan> Im very excited about getting the print (mentioned earlier) and when I get back from GenCon I am going to recruit my gaming group to play. [21:24] <+WetInkMatt> Yeah, thanks everyone! [21:25] <~Dan> Thanks very much for joining us, guys!